Flight Visualizer, track Un-filtered flights all over the world in Real Time! Beyond buzzwords like Big Data or Data Science, there are a great opportunities to innovate in many businesses using data analysis to get data-driven products. Data analysis involves asking many questions about data in order to discover insights and generate value for a product or a service. For small businesses, analyzing the information contained in their data using open source technology could be game-changing. All you need is some basic programming and mathematical skills to do just that. 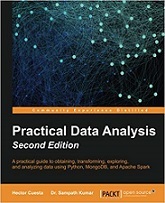 This free data analysis eBook is designed to give you the knowledge you need to start succeeding in data analysis. Discover the tools, techniques and algorithms you need to transform your data into insight. This book explains the basic data algorithms without the theoretical jargon, and you'll get hands-on turning data into insights using machine learning techniques. We will perform data-driven innovation processing for several types of data such as text, Images, social network graphs, documents, and time series, showing you how to implement large data processing with MongoDB and Apache Spark. Hector Cuesta Hector Cuesta is founder and Chief Data Scientist at Dataxios, a machine intelligence research company. Holds a BA in Informatics and a M.Sc. in Computer Science. He provides consulting services for data-driven product design with experience in a variety of industries including financial services, retail, fintech, e-learning and Human Resources. He is an enthusiast of Robotics in his spare time.